Attribute: Thought; Thinking; Reasoning הרהור HirHur Think it through before you act is a good attribute; yet it also makes it difficult to start acting. This relates to the right timing of something. Thinking is an attribute of Binah. One needs to learn to sometimes let go of thinking and reasoning and listen to our intuition and our unconscious trying to speak to us. Ancient Tribal Connection: Shimon שמעון Shimon is the Tribe that connects to Harsh Judgment. This comes from the idea expressed in the letters of his Name which is "Motion is my Name." This hints at reaction rather than pro action. When Levi and Shimon come together, the world can be destroyed. We must think before we act; yet Shimon does not do that. The Nasi of the Tribe of Shimon was killed by Pinchas who also did not think - Pinchas just did what was considered RIGHT. Usually human beings do what becomes wrong. 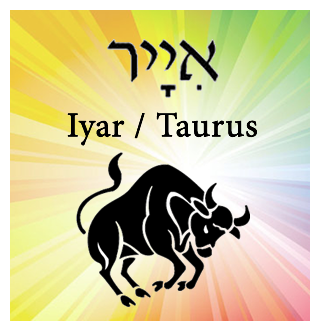 Zodiac Sign: Shor / Bull שור See below for information about the Zodiac sign of Shor. One hint is to realize that it is not the cow bull but the bulls of Africa. The water buffalo is an example. The letter Vav has two functions within the Hebrew Alef Bet. It serves as a connecting letter like the word "and" in English. The Vav also transforms the tenses of verbs. With the leading Vav the future tense becomes the past and the past tense becomes the future. We can see easily, by looking at a calendar, that Iyar connects the Omer period in Nissan to the Omer period in Sivan. These three months are connected through the Vav that created Iyar. 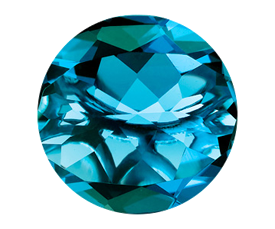 It also created the Astrological sign of Shor which is "the bull". The nature of the bull is placid stubbornness. That is the nature of the people born in Iyar. They like their comforts and will not go out of their comfort zone no matter how uncomfortable the situation gets. This year the Holiday begins on the Shabbat evening of April 28 2018 and concludes at sundown on Sunday April 29 2018. You will be reminded for eating matzah during the Sunday 10:30 a.m. Pacific Time class. This year Lag B'Omer occurs on the evening of the May 2 2018. We at Yeshshem will be having a late night study to connect to this energy starting at 8 PM Pacific Time. We will use the writings of Rabbi Shimon in the Zohar to connect to his energy as a channel to connect to the spiritual energy of Hod She BeHod. Please contact me if you want to participate in this connection by either phone or internet video conference. 1. There is no coincidence. The Torah speaks extensively about what is Kosher food during the month of Iyar. It is a good idea to be aware of the energy of the food that we eat. When animals are slaughtered in a manner that is not kosher their fear and emotions cause them to dump massive amounts of adrenaline into their bodies prior to death. Then don't eat non kosher meat. When you eat are you mixing the energy of continuity (milk products) with the energy of end (slaughtered animals)?